The tallest waterfall in France is Grande Cascade de Gavarnie – Gavarnie Falls. 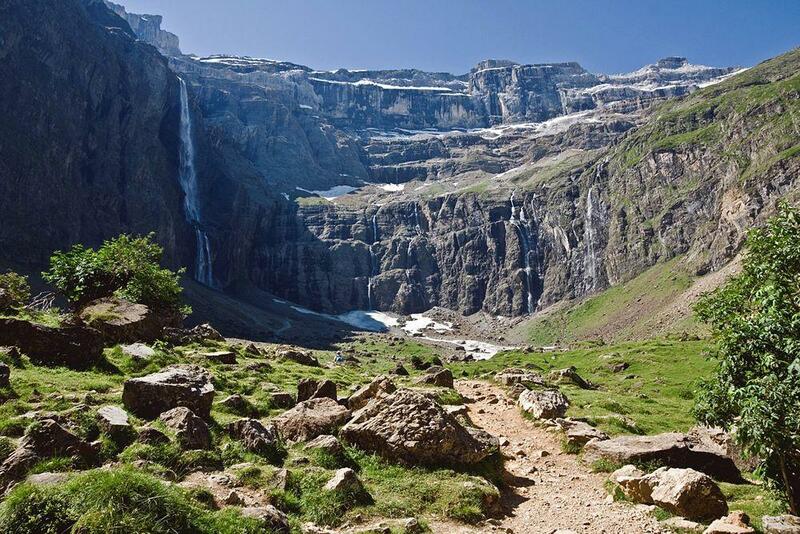 This 422 m tall waterfall forms a magnificent backdrop of Cirque de Gavarnie – the most dramatic landscape in Pyrenees. 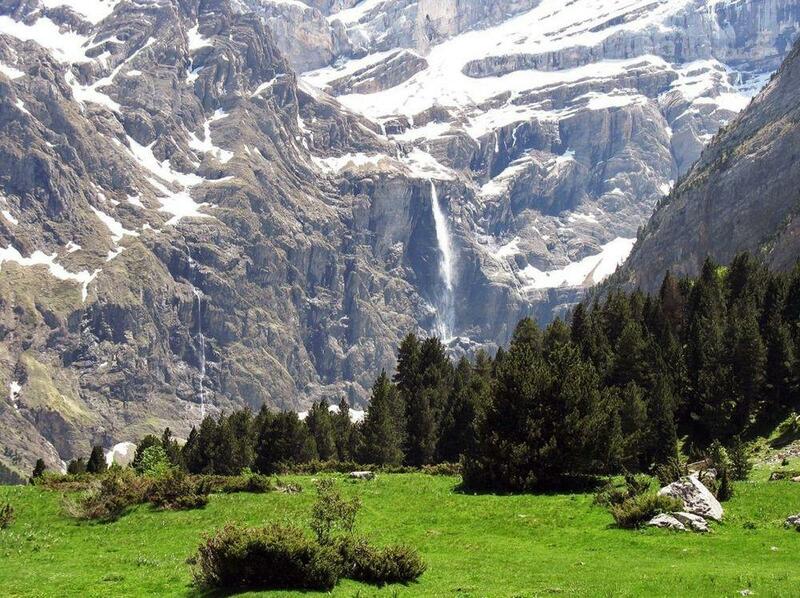 Cirque de Gavarnie is located in the tallest part of Pyrenees. This gargantuan rock amphitheater has formed at the base of the glacier over the last 20,000 years. This cirque is up to 800 m wide, enclosed by up to 1,676 m tall limestone walls. This magnificent site has preserved its pristine beauty, it is located in the Pyrenees National Park and together with surrounding landscape forms UNESCO World heritage monument "Pyrénées – Mont Perdu". 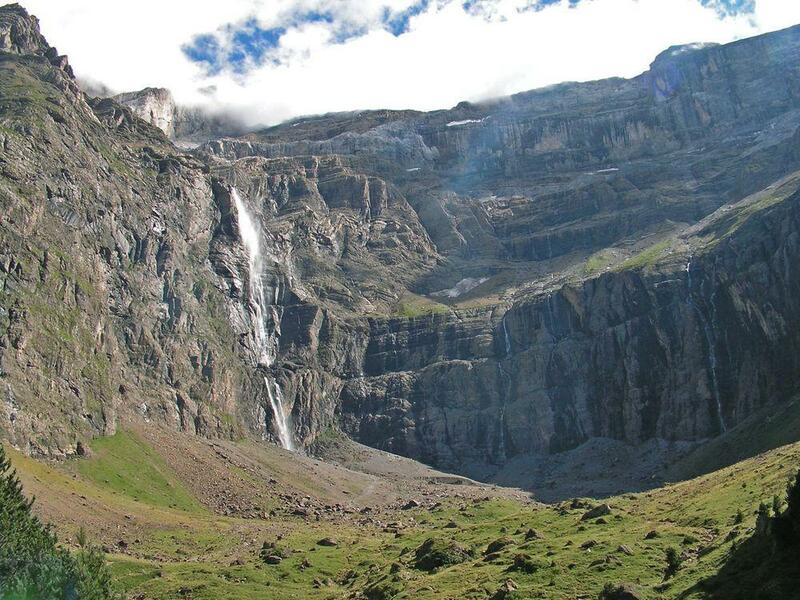 The water, which feeds the waterfall, is coming from the snowmelt and a small glacier, located in Spain. For most part it is seeping through the ground and appears exactly ar the rim of cliff as a waterfall. This is the beginning of Gave de Pau stream. There are drastic changes in the amount of water throughout the year. 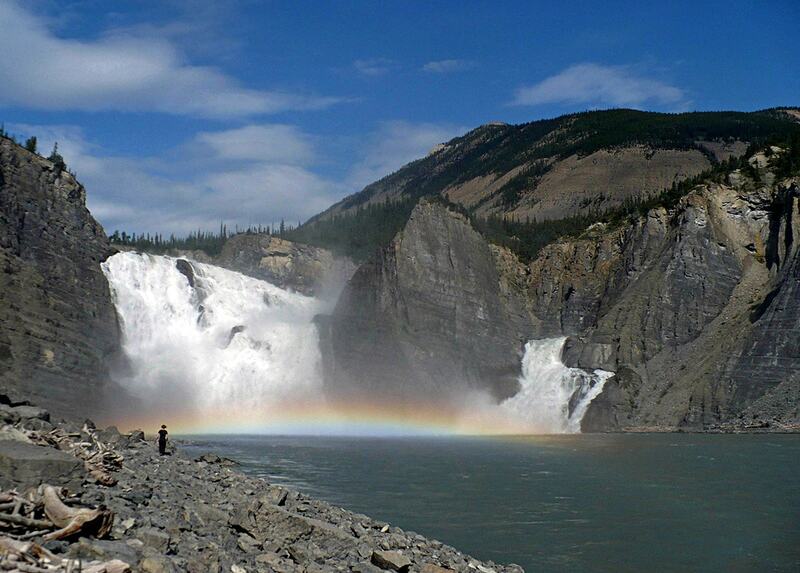 In the summer, when snowmelt is most intense, the flow of waterfall might reach up to 200 m3/s. In this period Cirque de Gavarnie is adorned with many more spectacular waterfalls. In winter the falls get frozen and the flow may stop altogether. Average annual flow is 3 m3/s. Grande Cascade de Gavarnie has 2 or 3 drops – the stream makes 91 m long horizontal distance but falls 422 m.
The tallest single drop is 281 m tall – here the water turns into mist. The force of waterfall brings down cold air from above. Due to this at the base of falls in spring – early summer is located a snowfield. The stream goes under it, forming a snow bridge. 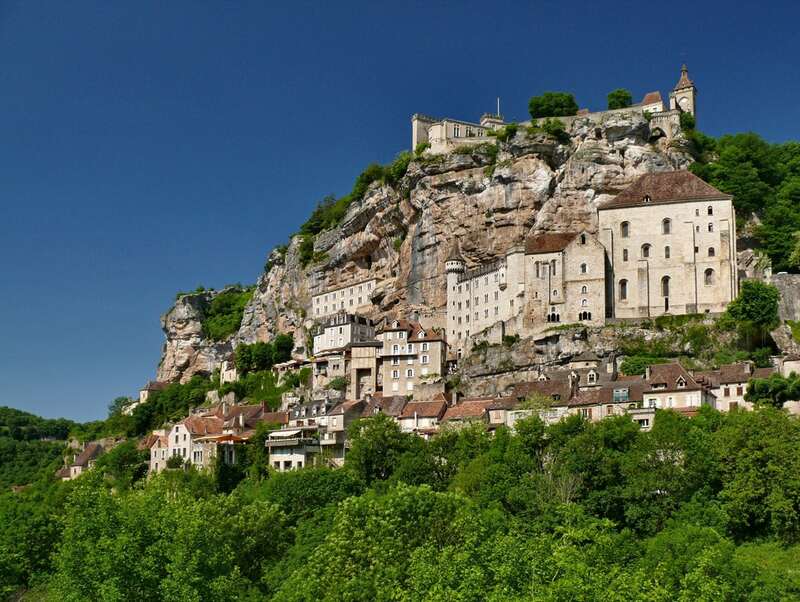 Midi-Pyrénées is very rich with diverse outstanding natural and man made landmarks. Highlights of this region are the magnificent natural landmarks in Pyrenees, medieval villages, caves and medieval churches in the small villages. Some of the most fascinating and awe inspiring natural monuments are waterfalls, or locations where a river abruptly changes its elevation. This Nature Travel Guide has the information and inspiration to guide your whole vacation/holiday or simply lead you on a memorable day’s nature watching. The continent of Europe, as a recognisable geographic entity, attained roughly its present shape around 20 million years ago. Even since then, the European coastline has undergone significant changes, due mainly to sea-level movements, to form the outline of the continent that we are familiar with from maps and the photographs of Europe from space that we view today.